We do not watch movies about or dedicated to pigs that often. And who would’ve thought anyone would be interested in watching pigs? In Allison Argo’s documentary “The Last Pig” does not have much to offer the viewer except little pigs with special needs. And yet, this story has so much more humanity and care in it than many films about humans we watch day after day. We meet the protagonist – Bob Comis and get to learn the reasons why he feels important to look after pigs and following him through his final season of pig slaughtering, we learn why he has made the life-altering decision to quit pig farming. Bob Comis was born in a suburb of New York and never imagines that one day he’d end up being a pig farmer. Like most people, Bob tried to find his calling. During the fifty minutes of the film, you’ll get to learn about his daily life, as well as the life of his pigs – what they do, eat, and even how their lives end. All these pigs have health problems, and it’s Bob’s mission to make sure that in the end, they will still make to our tables as pork. As inhumane and disturbing, as this sounds. In conclusion, Argo’s documentary touches upon an environmental issue without even mentioning it. It emphasizes the complete harmony between the human, nature, and animals. It highlights the importance to collaborate with Mother Nature, allow the life cycle go on with its natural flow, while a person with the required skills makes sure to provide what is needed causing as little damage to the planet as possible. You might wonder whether or not the future of our planet depends on pigs, and whether their existence will help us to preserve our planet for the future generations. Well, the answer is every creature has its own purpose on this planet. As humans have their mission to fulfill, so do animals. What we need understand is this simple logic of co-existence. And we need to make sure that the last pig on Bob’s farm won’t be our last hope for survival. Because that day might be quite possible – believe it or not. 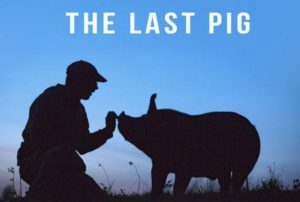 Movies like “The Last Pig” remind us that we – the humans – can and must do much better than what we do now.